Commack, NY—Tamron, manufacturer of optics for diverse applications, launched a new series of SP lenses that are optimized to make the most of the superior imaging performance delivered by advancements in digital photography. Sporting a totally revamped external appearance, the first two lenses in the series are compatible with full-frame DSLR cameras and offer fast apertures and versatile, fixed focal lengths. The SP 35mm f/1.8 Di VC USD and SP 45mm f/1.8 Di VC USD lenses can be used with APS-C-format cameras as well. In 1979, Tamron unveiled the first SP-series lens, the 90mm f/2.5 Macro. Since then, imaging devices have made dramatic advancements and diversification centered mostly on innovations in image sensor and signal processor technologies. Constantly innovating, Tamron developed lenses to stay abreast of the technological evolution. Lenses launched after 2012—including SP 24–70mm f/2.8 VC USD, SP 70–200mm f/2.8 VC USD, SP 90mm f/2.8 Macro 1:1 VC USD, SP 15–30mm f/2.8 VC USD and SP 150–600mm f/5–6.3 VC USD—feature refined functionality to sustain the requirements of the latest DSLRs with high pixel counts. 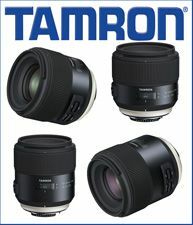 Now, Tamron has gone back to the root of optics to redefine all of the core attributes of its lenses. The new SP lenses were developed “seeking the highest level of performance, functionality and maneuverability, and a prestigious external appearance that reconfirms the high quality of the properties that are inside,” the company notes. According to Tamron, to develop these two standard lenses, all of the key performance criteria were redefined. VC (vibration compensation) was incorporated as an integral part of the optoelectronics design to expand shooting freedom. Priority also was set to allow dramatically closer focusing capability. And this all had to be accomplished in an overall mechanical package within practical size limits with an “elegantly sophisticated external design as a human interface.” Opto-mechanical construction and engineering processes are totally integrated. Both models also deliver a short MOD (minimum object distance) so that photographers can get closer to the subject with ease, and Tamron’s proprietary Floating system is built into both lenses. Plus, beneficial under all lighting conditions and especially useful in low light, their VC function is designed to provide noticeable advantages for handheld shooting by minimizing the adverse effects of camera shake. Other design qualities include: a brand ring that’s tinted “luminous gold” is positioned just above the lens mount; one side of the lens barrel sports an SP emblem in the same color; the window over the distance scale is enlarged 20% to maximize visibility, with the font style of characters and numbers newly developed to enhance legibility; the shape and sliding torque of the AF/MF change-over and VC on/off switches are configured and engineered to deliver comfort with operational feedback; and accessories, such as the lens hood and front and rear caps, are totally redesigned. Supplied with SilkyPix Developer Studio 4.0 editing software, the pair will be available September 29, 2015 in Canon and Nikon mounts for $599 each. A Sony mount will launch at a later date. Providing a 54mm-equivalent on APS-C cameras, this 35mm standard lens for those who prefer wide-angle shooting boasts a 7.9-inch MOD for full-frame DSLRs. This yields a 1:2.5 magnification ratio, which is claimed to be the shortest close focusing capability among fast-aperture, fixed focal, full-frame lenses. Since the lens allows for shooting close to the subject (similar to a macro), and aided by a 9-blade circular diaphragm, close-up pictures with a background blur effect (bokeh) can be obtained with the aperture wide open. The lens is also designed to offer a natural perspective and field of view, while providing a balance of performance and functionality. Due to the use of sophisticated glass materials and an advanced optical design, the lens is engineered for maximum aberration compensation. With 10-element, 9-group construction, it uses two molded glass aspherical elements, one LD (low dispersion) and one XLD (eXtra low dispersion) element. Two of the aspherical elements correct the field curvature, while compensating for spherical and comatic aberrations. High resolution is rendered from corner to corner, and the sagittal comatic flare that tends to become noticeable in night scenes is corrected. The LD and XLD elements compensate for chromatic aberrations, which often occur when using fast-aperture lenses. Other features include: eBAND (extended bandwidth & angular-dependency) and BBAR (broad-band anti-reflection) coatings reduce reflections to maximize light transmission and minimize flare and ghosting; fast, quiet autofocus is achieved via a USD ring-type ultrasonic motor; full-time manual focus override is available at any point during AF operation for shifting focus without switching the AF-MF mode; a fluorine coating on the front element repels water and fingerprints; and a sealed, moisture-resistant construction allows for shooting outdoors under adverse weather conditions. This high-speed, 45mm standard lens in the full-frame format with VC provides a 70mm-equivalent focal length on APS-C cameras. It offers many of the design features and functions of the SP 35mm lens. With 10-element, 8-group construction, it has two molded glass aspherical elements and one LD (low dispersion) element. Again, two of the aspherical elements correct the field curvature while compensating for spherical and comatic aberrations. It renders high resolution from corner to corner free from sagittal comatic flare, and its LD element compensates for chromatic aberrations. The SP 45mm’s MOD measures 11.4 inches with a “best-in-class” magnification ratio of 1:3.4 among fast-aperture, fixed focal, full-frame lenses. Tamron’s Floating system, which places a group of elements at the optimal location as the focusing group travels relative to shooting distances, helps ensure the best imaging performance at any range.